Most people, at some point in their lives, experience the stress of being interviewed for a job they want. Many also face the challenge of interviewing other people. But what does the science tell us about this unique social situation? What biases are involved, and how can we become aware of them? And how can job interviews be structured so that they are fair and effective? 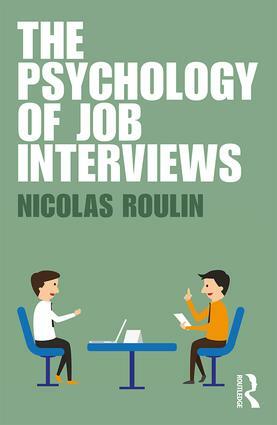 The Psychology of Job Interviews is the first book to provide an accessible and concise overview of what we know. Based on empirical research rather than second hand advice, it discusses the strategies and tactics that both applicants and interviewers can use to make their interviews more successful; from how to make a good first impression to how to decide which candidate is the best fit for the role. Illustrated with examples throughout, the book guides job applicants on how best to prepare for and perform in an interview, and provides managers with best-practice advice in selecting the right candidate. Debunking several popular myths along the way, this is essential reading for anyone interested in understanding what is really happening in a job interview, whichever side of the desk you are sitting. What is a job interview and why do organizations use it?